I planned the theme for this Story Weekend long before the devastating crash that occurred this week. My heart goes out to the folks who were affected. 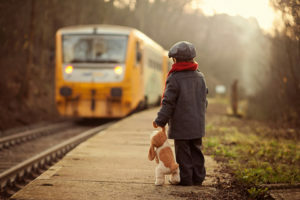 Hopefully you have a happier train story to share–in one hundred words or less! My little boys face lit up. His eyes were wide open taking everything in. His legs jiggled up and down in his pushchair and his curly red hair bounced all over the place. He wore the biggest grin on his face. Grandad tried to give him a kiss and he pushed him out of the way because grandad was blocking his view! He was so excited. He was going on a train journey with Nana and grandad. Our boy is two and a half and his favourite thing in the world is trains. We took our 4 year old grandson on his first train ride at a special weekend at an outdoor train museum where you could take a 5 mile ride. He was so excited but when the engineer asked all the kids to sing a train song and they all started to sing a song that I had taught him the summer before – he was beyond excited! We all sang I’ve Been Working on the Railroad as the train chugged along the tracks! My train story hasn’t happened yet. SP, one of the most special people and best friends on the planet, has terminal cancer that’s progressing way too quickly. He bucket list includes a train ride from Seattle to San Fran and she’s asked me to come along. I’m not sure if the logistics (money) will work out, but we hope to travel in the fall. We have the type of friendship where we can sit side by side with our kindles, hanging out with words or one of us can say we need ME time and we get it. I hope this train trips happens. My husband worked for the railways before being made redundant. We get free first class travel for most rail journeys. I travelled to the south of England to meet up with him after he’d done a ride along the south coast. The train I travelled on had a first class part of a carriage but it wasn’t obivious. Several men also sat down in it. A guard came along and said ‘I hope you have first class tickets’ I said nothing. The men sat there thinking she’s sitting this one out. Until the guard asked to see tickets and I was the only one left! We were going to visit my mother’s parents in Florida and we traveled there by train. I was a cranky pre-teen but, I believed, train savvy having traveled many times by train to NYC. About six hours into the trip I needed to use the bathroom. Up to the front of the coach I sashayed, hoping I looked train weary. I opened the door to the loo and found myself in a strange world. What was that thing on the wall? Well there was a toilet, so I used it. Coming out face to face with, horrors, a man. I quickly learned my lesson to READ THE SIGN ON THE DOOR. I boarded the train in Billings, Montana with my stepmother. We sat silently as the prairie swept by, occasional iron monoliths connecting the isolated towns of the plains. I squirmed in the seat as we approached Minot. I wouldn’t realize until years later that my breakdown, which had rendered me incapable of even finding my own spoon in my Montana primary school lunchroom, was rooted back in Minot, and I was returning like the lost, sacrificial lamb. Out of college 6 months, alone in the town where I had chosen to teach, and missing my family, I took a chance on the Crescent Amtrak train to bring us together. It not only brought me to my family, it was a fabulous experience. Going to the dining car to eat, where a surprise always awaited you. Not only were the white linen tablecloths and the succulent food a treat, but who would you meet at this meal? The porter seated you at the first available seat at a table already occupied. The Broadway Limited picked me up in DC and took me across the Pennsylvania farmland of Lancaster Country and closer to home. As the sun set over the train chugging westward, I knew I would see my family soon. Thought I would visit your blog to see what I have been missing. I can see that it is not very much. I always loved story weekend. Even when I was too busy to put words down, I loved to read every ones story. My dad loved talking about trains and the railroad. It is too bad I didn’t make time to sit with him and listen. Hope you are doing well Diane. I know you have been busy as I keep up with you. You are on my Twitter feed that comes to my phone. I’ve had to put the blog on the back burner. I just can’t keep up with everything, but I keep the blog here in case I someday want a space to post about what’s on my mind. Thanks for checking in!